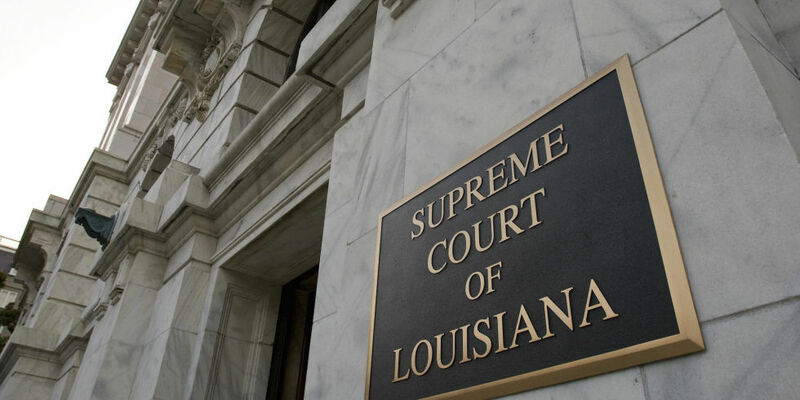 THE BILL OF RIGHTS IS HANGING BY A THREAD IN LOUISIANA | "Global Possibilities"
The law is supposed to be our protector, not our enemy. Since I suspect a lot of us will be talking about the inequities of the American criminal justice system (again) on Thursday—those of us who do not teach a section of Law 301: Elements of Vigilantism at respected law schools, anyway—it’s a good time to drop by the good folks at The Marshall Project to see what they’ve been up to these days. First, though, let’s revisit Gideon v. Wainwright, the 1963 landmark case in which the Supreme Court ruled that the 14th Amendment requires the states to provide counsel to indigent defendants regardless of the offense for which those defendants have been charged. Along with Miranda, which was decided three years later, Gideon was part of a pronounced legal shift in which the Sixth Amendment rights of poor defendants were strengthened against deliberate sabotage at the state level. Naturally, local prosecutors and ambitious law ‘n order politicians hate them to this day, and further despise one of Gideon’s most conspicuous progeny, the office of the public defender. The backlash began almost immediately, and it has been sadly successful, as Andrew Cohen pointed out in piece for The Atlantic three years ago. Today, sadly, the Gideon ruling amounts to another unfunded mandate — the right to a lawyer for those who need one most is a constitutional aspiration as much as anything else. And the reasons are no mystery. Over the intervening half-century, Congress and state lawmakers consistently have refused to fund public defenders’ offices adequately. And, as it has become more conservative since 1963, the United States Supreme Court has refused to force legislators to do so. “I think the Court doesn’t have the initiative to get involved in improving the administration of justice in every state,” former Justice John Paul Stevens told me in late January. “The Court’s really not the institution to get involved in that.” So today, the justices won’t secure the basic fair trial rights they themselves recognized in Gideon. And today, elected officials see no political value in spending the money it would take to ensure that every American has an opportunity for equal justice. It’s not that there aren’t solutions to the problem of securing a meaningful right to counsel for all litigants. There are plenty of solutions floating around. The problem is the political and legal will to implement those policy choices — to make good on the promise the Supreme Court made to America 50 years ago amid such hope and fanfare. Which brings us back to The Marshall Project, and to a woman named Rhonda Covington. Ms. Covington is a lawyer and a public defender. In fact, she is the only public defender in the entire 20th Judicial District of Louisiana. She is, to say the least, overworked. “There are days,” she says, “when I feel that I could literally scream to the top of my lungs for 10 minutes.” Every Wednesday, she makes an all-day trip to the infamous Angola prison to meet with clients. Every other night, she visits inmates at the local jail. Every weekend, she works. She also appears in court almost daily, where she handles all types of cases — juvenile and adult, misdemeanor and felony. Louisiana wasn’t the most honestly and sensibly managed state even in its best days, which might have been when a virtual dictator named Huey Long was running things. However, between the horrific ongoing after-effects of Hurricane Katrina and the presidential aspirations of its departed governor, “Bobby” Jindal, the services available to the state’s poor have taken a terrible beating, even as the current governor, John Bel Edwards, tries to pull the state’s finances out of the morass into which Jindal’s supply-side mumbo-jumbo sank them. The state’s public defenders, like Rhonda Covington, have taken it in the teeth. In the 16th Judicial District, for example, a single public defender stands by as groups of up to 50 mostly black, poor defendants are convicted of and sentenced to major felonies — all at once, all together — in a hearing that lasts a few hours or less. And in the 20th, exactly one woman, Covington, is employed full-time to represent poor people accused of crimes. Because her district initially received only $34,086 in assistance from the state last year to run a public defender’s office that covers more than 900 cases across two parishes, East Feliciana and West Feliciana, Covington has been forced to cut just about everything but herself. She recently dismissed an attorney (savings: $38,400 a year), reduced her secretary to part-time ($7,194 a year), canceled the office’s cell phone plan ($1,829.28), and discontinued housekeeping services ($2,400). She saves another $1,000 a year by having an inmate work crew mow the yard outside her office. Covington, whose clients call her “Ms. Rhonda,” wears a medical boot on her right foot because she tore a ligament a few months ago while running to the courthouse. She no longer has any health insurance, let alone worker’s’ compensation, for the injury. What results makes a mockery of what is supposed to be a model for the rest of the world as regards a criminal justice system. It more closely represents the canning line at a non-union meat packing plant. Here in the 16th Judicial District, at the St. Martinville courthouse, it is “felony plea day,” with Judge Gregory Aucoin presiding. Many of these defendants have not discussed their cases with their public defender yet and will have about 30 seconds to speak with him this morning. Then the judge, with a cigar dangling from his mouth, will ask, “Are you satisfied with the advice your attorney has given you in this matter?” “Yes sir.” “Yes sir.” “Yes sir,” they will all say, down the row. Okay, I accept your plea agreement.” And just like that, with no time for arguments to be heard in each of their separate cases, they will have all pleaded guilty together and will be headed to prison for years, sometimes decades. You read that and you think about what Abraham Lincoln once wrote in a letter regarding the Know-Nothing Party. It was in a different context, but not in an altogether different one. Our progress in degeneracy appears to me to be pretty rapid. As a nation, we begin by declaring that “all men are created equal.” We now practically read it “all men are created equal, except negroes.” When the Know-Nothings get control, it will read “all men are created equal, except negroes, and foreigners, and catholics.” When it comes to this I should prefer emigrating to some country where they make no pretence of loving liberty-to Russia, for instance, where despotism can be taken pure, and without the base alloy of hypocracy (sic). I think Rhonda Covington and those like her are heroes. I think that without people like her there would be nothing left of the Bill of Rights except the base alloy of which Lincoln wrote. I think that when her clients and their families look at the criminal justice system they see nothing but that same base alloy. I think word gets around and, pretty soon, the law, which is supposed to protect us all, starts to look like a farce and an enemy. And then, I think, things begin to happen outside the courtrooms. And they spiral and feed off themselves until a respected law professor suggests that your fellow citizens kill you with their automobiles. And where are we then, anyway?